We remarked in our En Primeur report that the 2013 vintage is heterogeneous, with quality varying greatly among chateaux. Chateaux with great terroir, who respected the grapes by not over extracting and who practised strict selections, produced grapes which achieved good ripeness and balanced acidity. Two of the red wines that followed this paradigm were Pichon Baron, the superb Second Growth from Pauillac and Smith Haut Lafitte, one of the leading wines from the gravelly soils of Pessac Leognan. Pichon Baron reduced their selection for the Grand Vin by 45% and their release price is 17% down on last year. Smith Haut Lafitte are known for leaving no expense spared in maintaining the quality of their wines, adhering to a similar strict selection, while reducing their price 9% on the 2012 vintage: we considered their 2012 one of the best priced wines during the campaign. We rated both 2013 wines highly and offer them today at £590 and £415 for cases of 12 bottles EP. James Suckling posits that Pichon Baron is a stand out wine in this vintage ‘This is fantastic for 2013 with seamless tannins and a long finish’ scoring it 92-93 pts. 2013 offers perfumed wines that will enter their drinking window within the next 4-5 years and when prices are correct 2013 becomes compelling. Christian Seely, the Englishman who manages the Estate clearly agrees and has sought to make their 2013 very interesting by reducing its release price by 17% on last years’ offering; as such the 2013 is the lowest priced of their last ten vintages. This offers an incentive to purchase in barrel and own a fine vintage of Pichon Baron for under £50 a bottle. Pichon Baron is known for being more masculine in style than the feminine Pichon Lalande. Pichon Baron’s wines are full bodied and concentrated with wonderful elegance and finesse. Pichon Baron and Pichon Lalande were once the same Estate; they were divided by Baron Joseph de Pichon Longueville on his deathbed giving what is known as Pichon Baron to his sons and what became Pichon Lalande to his daughters. Pichon Baron is one of the most famous Super Seconds; it is situated at the southern end of Pauillac next to St Julian. In the last ten years the Chateau has gone from strength to strength and is realising its incredible potential, largely thanks to Jean-Michel Cazes of Lynch Bages who has revolutionised the winemaking on Baron’s superb terroir. The Chateau itself is one of the most majestic anywhere in the world. James Suckling greatly revers Smith Haut Lafitte as a Chateau that must be considered amongst the best performers anywhere in Bordeaux. 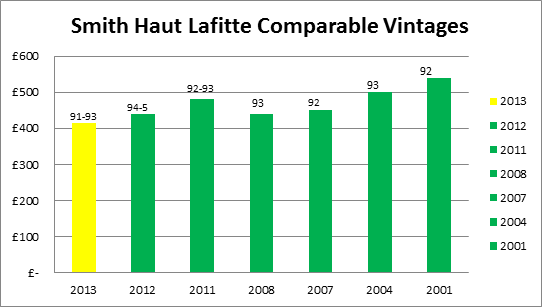 Smith Haut Lafitte scored 100 points and 98+ in 2009 and 2010 respectively; the Chateau itself is one of the most impressive in terms of technology and terroir and the wines reflect this investment and attention to detail. Suckling awarded their 2013 91-92 points remarking ‘This is very, very fresh with a bright berry and currant character.’ We viewed this wine as one of the best made in the vintage, offering cassis, blackcurrant, toast, smoke, cedar, tobacco white pepper and sweet spice: that’s a lot of wine for under £35 a bottle. 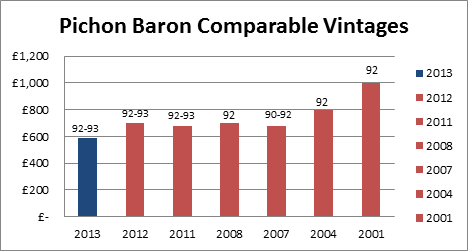 Like Pichon Baron the release price means the 2013 is the cheapest priced vintage over the last ten years, once again offering value and incentive to buy en primeur. Smith Haut Lafitte is located south of the city proper in the commune of Martillac and has been embarking on a large investment programme which has included a new cellar and in 2000 they switched from mechanical to hand harvesting. The grapes are stored in ergonomic pods designed by the proprietor Danial Cathiard to prevent oxidation. The Estate produces only 10,000 cases per year (reduced considerably in 2013) and the vine age is between 36 and 65 years. Smith Haut Lafitte Blanc was also one of our wines of the vintage and we will be releasing a separate offer for this later this afternoon for £600 per 12 bottles, it is a show stopper! We are also pleased to release Chateau Gloria 2013. Gloria is located in the Saint-Julien-Beychevelle commune and is a perennial favourite of collectors in the UK. Gloria offers the typical characteristics of the Saint Julien terroir at a fraction of the price of its illustrious Cru Classe neighbours. This is a great effort from Chateau Gloria with James Molesworth scoring it 87-90 points, placing it amongst the Classified Growths for the vintage. 87-90pts James Molesworth A plump, almost gutsy style, with dark plum and blackberry fruit, bolstered by ample roasted cedar and apple wood notes. Lacks range but shows solid muscle.